Recently a crew in the sim elected to hold until the completion of the Fuel Imbalance checklist before commencing an Approach. Since fuel balancing can take quite some time, they were in for a long wait. 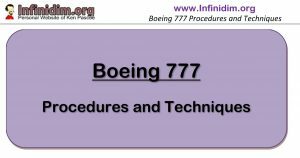 There is no restriction on commencing/continuing an Approach and Landing while balancing fuel with the Fuel Imbalance checklist in progress. Indeed this is to be expected when balancing fuel prior to approach. This is however one of the very few times when a NNM checklist is not completed prior to landing. 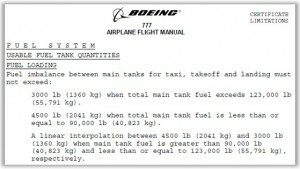 It’s worth noting that the AFM contains limitations on Fuel Imbalance dependant on total fuel quantity. 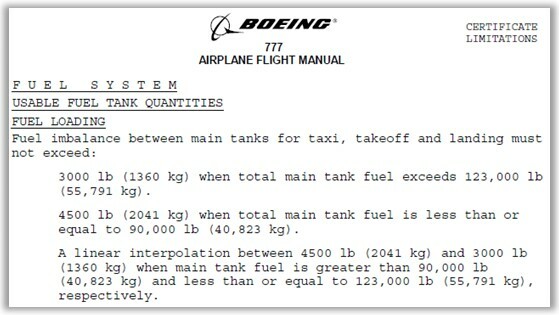 These certificate limitations on takeoff and landing with a fuel imbalance are not required knowledge (and therefore not included in the FCOM) because Boeing have taken steps to ensure crew deal appropriately with a Fuel Imbalance limitation exceedence – by prompting the crew through EICAS for the Fuel Imbalance checklist. Thus crew who ignore the Fuel Imbalance checklist “It’s not a Leak”; “It’s not a limitation” are in fact not responding appropriately. Of course the CM1 can always elect to delay initiation or halt completion of the Fuel Imbalance checklist when commencing the approach/landing (or something else) is the higher priority for flight safety. See SOP Guide EICAS/ECL “How NOT to do a Checklist” for a discussion of this issue and Fuel Imbalance specifically.